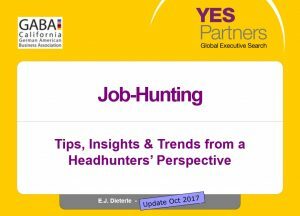 At any level in your career, it is important to network and make contact with executive search consultants so that you will be “on the radar screen” if a suitable opportunity arises. But if you are a senior-level executive, how do you make yourself known to quality (typically retained) search firms in your own and other countries? One way is to register with them resp. submit your details (resume) confidentially. It always pays to begin building relationships long before you think you will need them. This is particularly true when networking with executive search. If you wait until you are actually in transition and looking for a job before you approach search consultants, you may not get the reception you want. So, you want to work for a Start-up? Do you have what it takes? While joining and working for a Start-up is VERY exciting and can be very rewarding, an individual should take a close look as to what it takes to join the Start-up. There is a GREAT upside working for startups, of course, nevertheless nobody should forget that it could take months or years to a funding or successful exit, i.e. any individual joining especially a pre-funding Start-up should keep in mind that until funding is coming, typically no salaries will or can be paid. When screening potential management candidates for (pre-funding) Start-ups in our executive search practice, often qualified candidates have the right experience or background but simply cannot join the venture since they need a regular income (to pay for housing, mortgage, schooling, family, …). We recommend you do your ‘homework’ prior to joining the Start-up to make sure it is a ‘match’ between the company needs and your desires. Job-seekers do not pay fees to search firms. Instead, the companies that hire recruiters to fill a position pay for their services. This fee is calculated using the starting salary of the position and can range from 15%-30% of that salary. Be wary of any recruiter who asks you to pay them a fee! While both types charge fees only to the hiring organization, it is important to note the differences. When the hiring company retains a recruiting firm, that firm is paid regardless of the results of the search. Retained firms are typically used to fill higher-level positions at $100,000+ salaries. Contingency search firms receive payment only when their candidate is hired and are usually used for lower to mid-level positions. Don’t limit your search by geography. For many higher-end job assignments, recruiting firms will look nationally or even internationally. It is absolutely in your best interest to gain exposure among search firms who fill positions in your industry, function and salary range, no matter where they are. That being said, it is much easier to network with local recruiters and they can be an invaluable resource when penetrating the local hiring market, particularly for non-executive positions. Networking and building relationships with qualified, reputable recruiters is a critical component of career management strategies. What if a Recruiter Contacts You? You are happy in your current position. What if you get a call from an Executive Recruiter? Learn what jobs are available! You never know when a recruiter might present a better opportunity. Expect to be Contacted. As openings increase, an experienced executive who earns six figures or more can expect to be contacted. Employers traditionally prefer to raid the ranks of the employed, especially those working for competitors. Potential candidates come from various sources, i.e. the Internet, industry or functional databases, a search firms’ resume files and recommendations. Sometimes more than 250 candidates are contacted for every opening. Always take the call. Chances are you won’t be contacted by the search firm again. Find out more about the search firm and the job opening. No one should ask you, the prospective candidate, for money. Read between the lines. During your first conversation, you won’t be given the name of the hiring company, just a brief description of the opening and its requirements. The recruiter will then ask if you know anyone suitable for the job. Be equally discreet in return. Your next conversation should probably occur outside your office. If you are not interested, say so, but offer the names of people who might be. You will be helping your contacts and the recruiter, which can put you on his or her short list to call next time. Be articulate and positive. The fact that you’ve been called means you have the right background for an opening. Don’t assume you’re just chatting; the search firm will be evaluating whether you have the communication skills and other “intangibles” needed for the job. Do not exaggerate. When asked about your accomplishments or earnings, don’t exaggerate and be realistic. Recruiters check references and any false information will disqualify you. If you are still interested and continue to impress the search executive, your name, along with other potential candidates’, will be submitted to the client (company). If you are suitable, the next call you receive will be to schedule an interview. More questions about Executive Search? We’d be more than happy to answer them. Send your question(s) to our team.